There’s just something about a mean-looking race car staring you right in the eyes. Meet the Ferrari 488 GT3 racer from the IMSA WeatherTech SportsCar Championship, which finished second in its class at the Chevrolet Sports Car Classic in Detroit over the weekend. Our dear photographer friend Kurt Bradley spent the weekend with a bunch of sports cars in Detroit, and he was kind enough to send this photo over for all of your wallpaper needs. It’s the No. 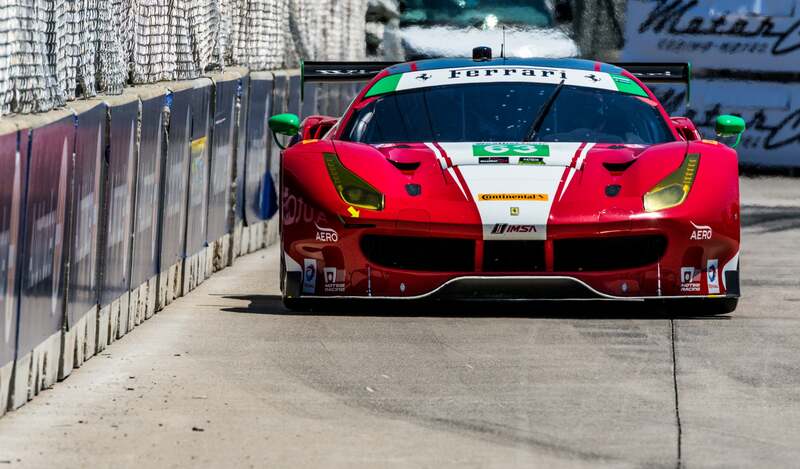 63 Ferrari of Christina Nielsen and Alessandro Balzan, which races in the GT Daytona class and finished 12th among all classes in the Detroit race at Belle Isle Park. Nielsen made history in this car in 2016 by becoming the first woman to win a major present-day North American endurance championship, after she missed it by just two points the year before—Nielsen’s first full season in IMSA’s top endurance series. May your week be as productive as Nielsen seems to be in everyday life. And, if you have any photos you’d like to see featured as a weekend wallpaper, feel free to send them to the email address listed below. Photo credit: Kurt Bradley. Used with permission. For more photos, head on over to his website, Instagram account and Facebook page. For a big desktop version of the top photo, click here.